Art and Medicine Bibliography, Charles-Alexandre-Gaston Petiau. Contribution à l'étude du traitement du bec de lièvre double compliqué. Blois : J. Marchand, 1875. Description : -64 p., [3 l.] pl. ; ill.: 2 litho., 2 phot. figs. ; 24.2 cm. Photographs : 1 carbon print (photoglyptie) mounted on printed card, a composite showing before and after views of the surgical subject. Subject : Upper lip — Cleft lip ; complications & treatment. Author caption: Par C.-A.-Gaston Petiau. Né à Blois (Loir-et-Cher), docteur en médecine. Rare, fewer than 10 copies listed in OCLC. Celle-ci gagne de proche en proche et, un mois après, on peut constater le rapprochement des différentes parties de la lèvre, par les seuls efforts de la nature. Plus tard, ce rapprochement fit des progrès et la restauration fut parfaite, comme on peut en juger d'après la photographie représentée à la planche III.–Page 60. Petiau's capable doctoral thesis on the surgical repair of double cleft lip, dedicated to his mentor, Didier-Dominique-Alfred Richet (1816-1891). Plate I is a lithograph drawing of a pince écraseur, an instrument Richet originally devised for removing uterine polyps, similar to an enterotrite, but adapted here for crushing the intermaxillary segment. 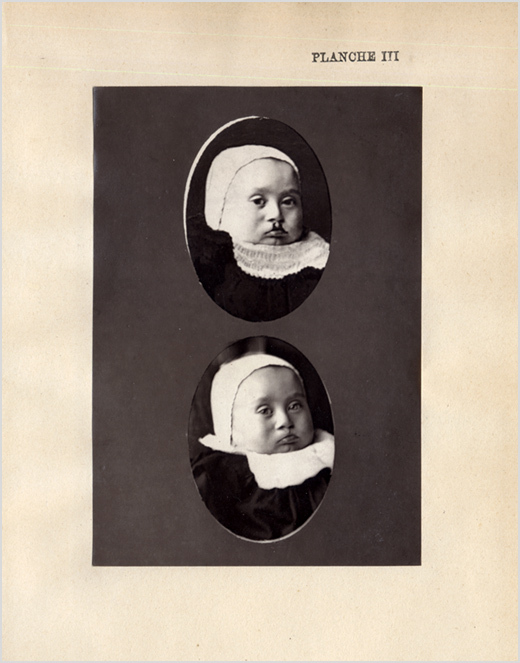 The composite photograph represents views, before and after surgery, of the head of a four-month-old male. Petiau was a chevalier of the Legion of Honour and served as mayor of Saint-Gervais-la-Forêt, 1919-1925.